THE Optimum PerformancePower Bar quartet of Kevin Dawson, Wayne Randle, Mark Lovatt and Gary Speight stormed to victory for a second consecutive year in the national 100km team time trial championship at Raglan, Gwent. It took the northern-based squad 2-04-45 - the third fastest winning time in the 25-year history of the RTTC championship - to defend the title they won last year ahead of Invicta RC and Team Sabre. This time around, it was North Wirral Velo-Kodak and Leo RC who filled second and third places respectively in the Cardiff Ajax CC promotion on the RS/100K course. 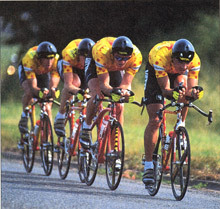 Pete Longbottom and Paul Jennings, who were in North Wirral's winning 1993 squad along with Chris Boardman, were joined this time by Chris Newton and Julian Ramsbottom. They finished in 2-07-47 to take second place by 1-25 from the Leo foursome of Stuart Dangerfield, Zak Carr, Gary Dighton and Bill Moore. As the times show, Optimum Performance were in a class of their own. Wembley RC - with triple individual champion Richard Prebble, Ian Gilkes, Andy Lyons and Paul Rogers - were 43 seconds off the bronze medal in fourth spot, while Wrekinsport CC (Barry Charley, John Stollery, Graham Birch and Jason Meyer) were fifth in 2-14-49. The experienced VC Deal team of Malcolm Whitehead, Tim Bayley, Andy Proffitt and Nick Marsh rode into sixth place with 216-02. Starting at Raglan, the course took the riders via Abergavenny to the turn at Hereford, 1.59 kilometres past halfway. Dawson, Randle, Lovatt and Speight had established their position by the midway point, taking 106-34 to cover the outward leg mainly into the wind and seemingly uphill. Their return journey took just 58-11 - which showed just how tough the outward trip had indeed been. Longbottom and his North Wirral Velo squad were 2-20 slower to the turn, while the Leo RC trailed Optimum Performance by exactly three minutes as Hereford was reached. With temperatures soaring for the later starters, the early riders had a slight temperature advantage but this was to prove. little help against the all-conquering Optimum quartet. Longbottom, unusually without a national medal to his credit so far this season, clearly intended to put this right. Before them the GS Metro had gone past the check in 1-13-06, while Team Sabre were credited with 1-12-05, well off the pace for a repeat of their 1994 third placing. Newton headed Wirral's quartet into the turn, with Longbottom's face showing the concentration that has taken him to countless national honours. With a 1-08-54 halfway time the Wirral took the lead. Taking advantage of the wind on their backs Longbottom and company stormed back in 58-53, easily taking the lead with an impressive 2-07-47. In full flight, Stuart Dangerfield set the pace for Leo RC on the downhill run to the last turn. A clear run into the roundabout and the four were gone, with Zak Carr taking the front for the climb back from the turn before the long downhill run back to Abergavenny. Pushing his biggest gear, Gary Dighton led the charge back at well over 30mph, but they had some hard riding to do if they were to beat the Wirral. A turn time of 1-09-34 put the Leo 40 seconds down. A final 2-09-12 increased their deficit to 1-25 on the Wirral. It was time for Optimum Performance to enter the fray. Back at event headquarters their 50km time was posted as 1-06-34, giving them a 2-20 lead over the Wirral at that point. Wayne Randle led them as they headed for the turn at Hereford. The four had to break hard as a car moved out in front of them at the roundabout, but they safely negotiated that difficulty and were soon heading back for Raglan. Randle, former BBAR Kevin Dawson, Lovatt and Speight were riding as one, the pace steady, if that is the right term to use as they powered along at between 35 and 40mph. As the three kilometre board was passed Lovatt led, then Randle, Dawson and Speight. Past the last roundabout, scene of a fatal coach crash earlier in the week, and it was all over. Optimum Performance were champions once more. `We all rode well and had no trouble,' said Kevin Dawson, spokesman for his Optimum Performance team-mates Wayne Randle, Mark Lovatt and Gary Speight. The team claimed they had not done any special training for the championship. `We have just been riding plenty of road races together, and that was enough,' said Speight. A smiling Wayne Randle looked as though he could do it all again. `No one was stronger than anyone else,' he said. `We kept together all the time and never had a bad patch,' added Gary Speight. Peter Longbottom was just happy to have won a medal at last. `I was beginning to give up hope,' he said. `We rode as well as we could today and I must say I suffered. Chris (Newton) was the strongest of us, he really had the boot down when he went to the front in the last quarter of the race. 'it was a good course,' added the Commonwealth silver medallist. 'it was never flat - it was made for strong roadmen, that is where the Optimum Performance had the edge on us. We all rode well, but we just didn't have it today,' Longbottom conceded. After the official presentations were over, event secretary Paul Pettipher called on Keith Boardman, a member of the Birkenhead North End `A' team, to pass everybody's good wishes for a speedy recovery to his son Chris.